TALLAHASSEE – Twenty-four years after posting its first website, the Florida Supreme Court on Thursday unveiled its first smartphone-friendly website. The new design gives the state’s highest court room for growth and for phone app development as Twenty-First Century communications technology continues to evolve. The new website is at: www.floridasupremecourt.org. In developing the new site, customer service was the highest priority of the development team. App development was high on the list of concerns as the website was built. For example, the Court plans to deploy an app in the next few months that will take one of its most complex set of web-based legal documents – Florida’s standard jury instructions – and make them easy to use on wireless devices by lawyers, litigants, and judges in courtrooms. The new Jury Instruction App will organize the thousand-plus pages of instructions currently housed on the Supreme Court website. Anyone in the courtroom will be able to find the proper jury instructions on the app, download them, and modify them as needed for the case at trial. The new website also is the first created for the high court since it adopted a landmark Court Communications Plan in late 2015, which has become a model for courts around the nation. The plan urges state courts to make better use of technology to communicate with the public, including better websites, social media, podcasting, and phone app development. The new website, for example, integrates the Court’s social media channels and its archived argument broadcasts into the overall design of its pages and the case information. 1. Opinions: The most common thing people want on the website are Florida Supreme Court opinions. This tab also offers ready access to the opinions of Florida’s other appeal courts as well as judicial ethics opinions and cases on the Rules of Court. 2. Oral Arguments: Easy access to live-streamed oral arguments also is in high demand. Using this tab, anyone can quickly find the live stream, archived videos, oral argument press summaries, and related documents. 3. Practice & Procedures: People who have business with the Supreme Court need access to filing information, information on clerk’s office procedures, jury instructions, and forms. This tab gathers those links in one place. 4. Case Information: The public, lawyers, and journalists frequently need information on pending and previous cases. Using this tab, they can find the Court’s online case docket and information about its contents. 5. News Media: Since the mid-1990s, the Court has given news reporters online links to help meet their work deadlines. This feature remains part of the site. Journalists and others can find links to pending and archived high-profile Supreme Court cases, judicial discipline (JQC) cases, death warrant filings, and other newsworthy topics. 6. About the Court: The last of the six major categories contains information about the Florida Supreme Court itself. Biographies of the current Justices, information on Court departments, historical information about the Court, and access to official photographs are all available here. 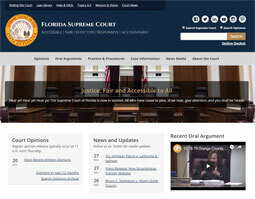 The Florida Supreme Court has long been a trendsetter in the use of web-based information. In 1994, it became one of the first courts in the world with a website. By 1996 when the Court’s Public Information Officer was created, it began using its website to give the public and the press online access to opinions, briefs, and other documents. In 1997, the Court pioneered the use of live and archived video streaming and satellite broadcasts of its oral arguments. And it continued the tradition of online openness earlier this year when it offered those same oral argument videos on Facebook Live for the first time.